“I want to prove to myself that my body’s capable of great things,” she said before the Games began. Pichelli, who this year competed as an individual for the first time, ended up winning the Legless event on Friday night—what she describes as her most memorable Games moment. For Briggs, it was an obvious choice. On Episode 290 of CrossFit Radio, host Justin Judkins interviewed three people who attended the CrossFit Tour stop and Affiliate Gathering in Big Sky, Mont., from Aug. 16 to 18. 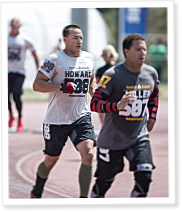 Jonathan Gonzales and Maria Aragon De Gonzales of Arbor CrossFit are featured in the first half of the show, and CrossFit Games Masters champion Craig Howard is featured in the second. Patrick Miller is a typical kid from a working Midwestern town. This is his coming-of-age story in which there may or may not be a happy ending. Can the uptight ever hang loose? Hilary Achauer examines her complicated relationship with surfing. The paddle out was easy that day. I didn’t even get my hair wet. I sat on my board with my dry hair and forced myself to look at the ocean, at the sky. I looked at the people walking on the beach and made up little stories about the surfers around me.